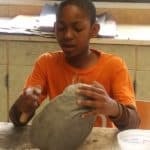 The Ceramics program provides students with the techniques needed to use clay as a medium of expression. No art experience required. 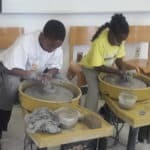 Students are able to learn the potter’s wheel and hand building techniques to design and produce their own unique functional and sculptural pieces. 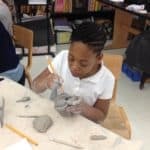 The process of designing and building works in clay is used to explore and develop the students’ creative thinking process and to help them to focus their ideas and intent while building technical skills. 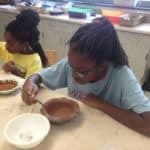 They are introduced to the uses of ceramic materials in science, industry and contemporary life, the techniques of several clay artists and some historical clay works. Students are encouraged to engage in explaining and make meaning through their art. 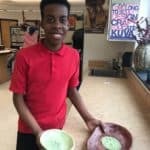 Students are exposed to ceramic artists from around the world. 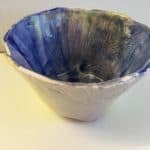 Megan is a ceramic artist and graduate from the BFA program at Tyler School of Art, Temple University. Megan has experience working with children in Harrisburg and Philadelphia. 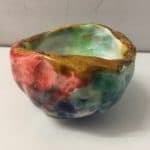 She specializes in wheel-thrown pottery and incorporates elements of drawing and painting with three-dimensional forms. 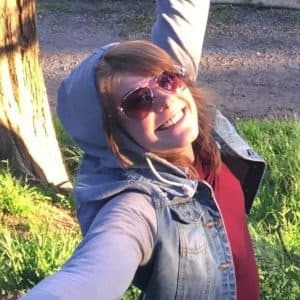 Her work often features themes of sustainability, wellness, and (im)balance. This is Megan’s second year with West Park Cultural Center. 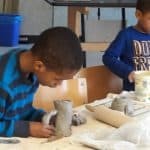 West Park Cultural Center honored Janice Merendino who founded our afterschool Ceramics Program and retired after nine years as its instructor. 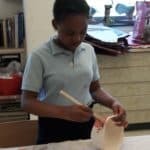 A special scholarship was created in her name to provide a full school year of afterschool ceramics to a deserving child. Enjoy our special movie below.